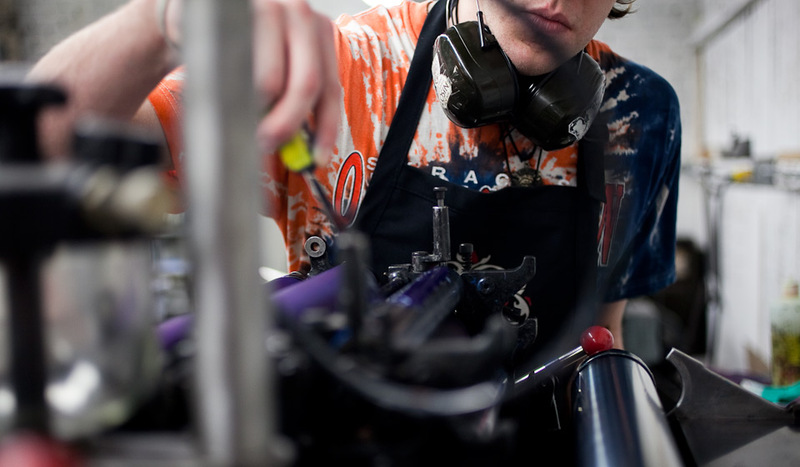 Stuff you should know about working with our letterpress shop. Why choose us. Because we know what we’re doing. Because we’ve been doing this for a long time. Because we have a lot of old presses. Because we are the largest letterpress shop in North America. Because we have large hearts. Because we understand your need for perfection because we’re also perfectionists. Because we all like the planet, right? Because we have two ‘r’s, two ‘s’’s, and a ‘b’ in our name. Because words that begin with ‘b’ — balloons, bananas, Bali, bubbles, babies, bread — are often good. Because…have you seen our portfolio? Our client list. Sony BMG, the Whitney, AOL Time Warner, NBC Universal, Domino’s Pizza, Hickory Chair, Barnes & Noble, Republic of Tea, P-22 Type Foundry, the London Hotels, Robert Mondavi Winery, M Night Shyamalan, Condoleezza Rice, numerous New York Giants and Indianapolis Colts players, Amy Grant, Ted Danson and Mary Steenburgen, Jimmy Johnson, Barry Meyer (Chairman and CEO of Warner Brothers), the Lyric Opera of Chicago, and hopefully you. Promises: we stand behind the quality and craftsmanship of our work. If you are ever unhappy with something that we created, let us know and we’ll make it right. The process. Review our portfolio, order samples and request a quote. Then fill out our order form. Send in your design files. We’ll email you our printing contract. Once we have your signed contract, final design files, and a 50% non-refundable deposit, we’ll get to work. How to send your files: email your files (under 5 MB) to printing@boxcarpress.com. If your files are larger, use a service like yousendit.com. Or you can upload your files to your own web site and send us the url link. File formats: we prefer press-quality PDF files, though we also accept Adobe Illustrator, Adobe InDesign, and EPS files. Read about designing for letterpress and designing for foil. Before sending in your files, make sure you’ve outlined your type; included actual crop marks or a cut rule; and set up your files in solid, uncoated Pantone colors. We offer file prep services, if needed, at an hourly rate. Digital PDF proofs: our standard proof is a digital PDF proof, which will allow you to make sure your files downloaded correctly. It will be emailed to you within 2 business days from when we have your signed contract. This is the file we use to make your plates, so please be sure that the proof looks exactly right. Ink drawdowns: if color is absolutely critical, you may want to order an ink drawdown. This is a sample printed in your exact colors, on your exact paper, but using random plates. Ink drawdowns allow you to see exactly how the ink color looks on your paper. The cost for an ink drawdown includes overnight shipping, and it may add additional time to your turnaround — ask your printing coordinator for specifics. If you’d like this option, mention it on your order form. Press proofs: if you or your client wants to see an actual printed sample of the job prior to us running the entire job, you should order a press proof. Contact us for a quote, as cost varies depending on the job (it will generally be about the same price as ordering 25 pieces.). This may also add additional time to your turnaround — ask your printing coordinator for specifics. If you’d like this option, mention it on your order form. Letterpress inks: choose from our stock inks, or we can special order any other Pantone PMS color for a one time charge. We can print with letterpress metallic inks, though they’ll only show a subtle glitter on uncoated paper. You can look up our ink colors on your end by using a Pantone solid formula guide (uncoated). That’s the same guide we use for color matching in our shop. Edge painting is available in all of our letterpress inks. Foil colors: check out our colors for foil stamping. There is no formula guide for foil: if you’d like, we can mail you foil swatches, just let us know. Foil edging is available in all of our foils. Impression depth: can range from a kiss impression to a heavy impression. Unless you tell us otherwise, we’re assuming you want a heavy letterpress impression. Turnaround: Most jobs ship 10 business days after final PDF proof approval (which happens after order entry, contract approval and receipt of deposit). Jobs that require duplexing ship15 business days after final proof approval. We also have several rush service options – call us with your turnaround needs and we’ll do whatever we can to accommodate you. Payment terms: first time orders need a 50% deposit, with the balance paid before we ship. We accept Visa, Mastercard, Discover, and American Express. With agencies, corporate clients, or universities, we can work from a PO. If you’d like to work Net 30, fill out our account application. We begin review of credit applications immediately, though the process can take a few days depending on how quickly your vendor references respond. New York sales tax: charged on all items shipped to a New York address (unless we have a resale certificate on file for you). New York sales tax varies by county: we will charge your New York county’s sales tax rate. Domestic shipments: your options are ground, 3-day, 2-day air, and next day air. We ship via UPS from Syracuse, New York. International shipments: we use UPS worldwide saver. Please note! Our international shipping rates don’t include tariffs, import taxes, or customs and brokerage fees. Generally the shipping company collects these fees directly from you when they deliver your package. The brokerage fees are usually a percentage of your total dollar amount and paid to UPS. Brokerage and customs fees are NOT the same as tariffs and import taxes.